I’m really into Ramen right now. My boyfriend has been traveling for work a lot the last few weeks. Which means that I have been spending a significant number of evenings at home alone eating takeout and watching trashy tv. Then I frantically clean the house on the day he is returning home so that he doesn’t walk through the front door and worry that we’ve been robbed or that squatters have moved in. Turns out that when I have the house to myself I don’t worry too much about things like dishes, cooking, cleaning, or for that matter, showering. Lately, in the midst of all this takeout, I’ve been really into noodle soup. Specifically, ramen. I came to this realization this past week. On one Friday, I had ramen from a new local joint and loved it. By the next Monday I was out of leftovers and craving it again, but decided to shake it up. So, I picked up some Pho at a local vietnamese place. It was good, but wasn’t what I really wanted. Tuesday I stopped in the International district at this great Chinese noodle house and got a noodle soup with wontons. And it was also really good, but didn’t satisfy my craving. Apparently, I only want ramen. To be clear, I’m not talking about Top Ramen. Though I have certainly enjoyed my fair share over the years of those magical, salty, msg loaded noodles. In fact, I really like using the noodles in stir fries (without the weird flavor packets), so I keep a couple of packets stocked in the pantry. I also really like them when I’m sick with a cold. I cook up a block of noodles with half the weird seasoning packet and then load it with lots of Sriracha and soy sauce. Don’t judge me. I’m telling you, when I’m all clogged up with snot, sometimes super spicy salty noodles are the only thing that 1. makes me feel better and 2. that I can even taste. So anyways, if ramen isn’t about the magical 3 minute cooking packets, what is it all about? In the real world, it is about the broth. 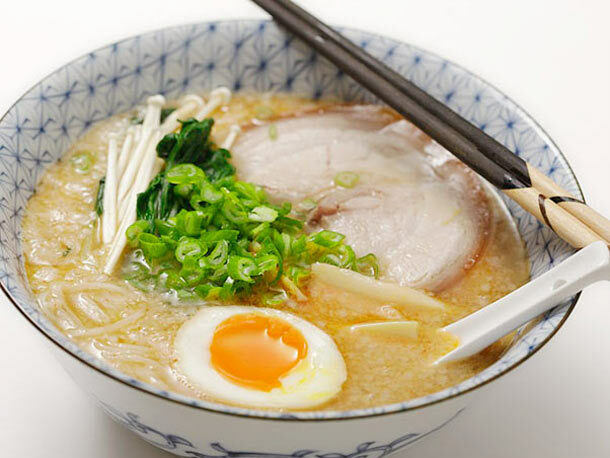 There is vegetarian ramen out there, but my favorite right now is Tonkotsu, which is a pork broth that has been slowly cooked for hours and hours and hours, usually served with fresh noodles, slices of pork, and soft boiled eggs. The broth is sometimes flavored with Miso or soy and is always rich, salty, and delicious. And the soft boiled eggs melding into that broth is often my very favorite part. Shoyu ramen is also delicious and is a soy sauce based ramen with a chicken and/or vegetable stock base. Now if you are not lucky enough to have a ramen restaurant in your area, I’m terribly sorry. Really I am, because in case you haven’t caught on yet, I’m a little obsessed at the moment. But all hope is not lost. I’ve been experimenting with making ramen broth at home. I’ve also got a good friend trying to figure it out. Maybe between us, we can unlock the answer to the perfect ramen broth. My first attempt wasn’t perfect, but I’m a woman on a mission now. Is it weird to just post about how much I love ramen right now? Maybe. But in case you haven’t noticed, I’m kind of weird y’all. Welcome to my world.